Low spoilers ahead - Earlier today in LCS 100 Thieves and Clutch Gaming locked horns, with CG Huni in the top lane picking up Zilean against 100 Ssunday on Urgot. It was only until five minutes in when 100 Bang paused the game for a "visual bug" when they realized there was a new diabolical strategy at play. Turns out Huni's plan was to pick up Kleptomancy and cheese his way to a gold advantage. Check out the details below! Attention: After completing the 500g gold quest, start CSing since you no longer get the tribute penalty. In the first 5 minutes, there are 8 waves, or roughly 1000 gold. Maxing out Spellthief's gold generation (including hitting enemy champions), results in roughly 12 gold every 10 seconds. Maxing out Frostfang's gold generation (including hitting enemy champions), results in roughly 22 gold every 10 seconds. To get to 500 gold with this item, it will take at optimum, 136 to 250 seconds or about 2 to 4 minutes depending on when you upgrade your gold item. With minion spawn time and reduced efficiency, we can estimate 5 minutes is the average time to finish the quest. Kleptomancy gives you 5 gold plus an item that averages about 29 gold (not including lucky Sacks of Gold). In order to get about the same amount of gold as someone playing "standard", you'll need to proc Kleptomancy around 15 times. After completing your gold quest, you are no longer subject to the deactivation penalty when you CS. This means that you get an extra 22 gold per 10 seconds for the rest of the game on top of your regular CS as long as you're in lane harassing. 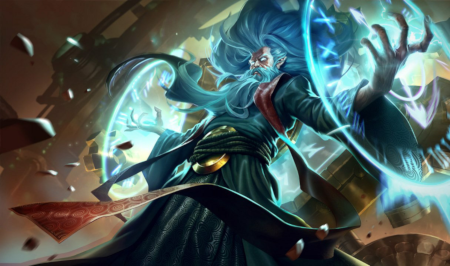 Zilean and Karma are definitely going to be the two champions to watch out for in the top lane abusing this strategy. In solo queue however, players may be more prone to playing too aggressive to proc Kleptomancy and end up dying to all-ins from champions with stronger starting items. What do you think about this gold generation strategy? Comment below!